A comparison of NaturallySpeaking alone vs.
Dragon NaturallySpeaking works well for dictation -- getting words on the screen -- but not so well for controlling your computer. Utter Command adds intuitive command-and-control that's twice as fast as the keyboard and mouse. Here are step-by-step examples that show how much the Utter Command add-on will speed you up. 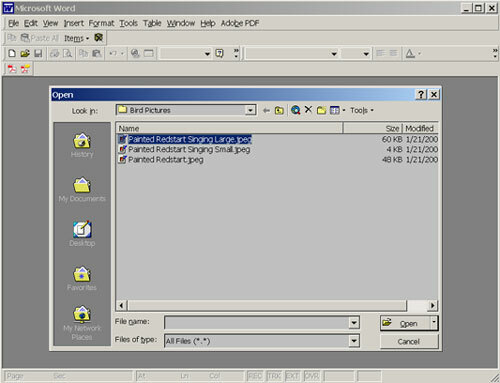 "Word Open Bird Pictures Folder"
With NaturallySpeaking alone you'd say around 10 commands: several commands to click the point where you wanted the window to move, for example, "MouseGrid 3", "4", "3", "Click", then say "Remember Point", then say several commands to click the window, for example "MouseGrid 2", "5", "9", "Click" then say "Drag to Point"
NaturallySpeaking plus Utter Command enables this with a single command. "Window 50 By 0", for example, puts the top right hand corner of the window in focus at the top middle of the screen. See the steps required to do additional common tasks using keyboard, mouse, NaturallySpeaking and Utter Command. Utter Command Task Tours take you through common tasks. Compare the number of Utter Command steps to the number of keyboard and mouse steps for the 36 Task Tours, which include surfing the Web, emailing, cutting and pasting among programs, making an Excel chart and making a PowerPoint presentation. Utter Command averages 1 command to every 2.3 keyboard/mouse commands.